I may be the only one excited for the time change. I know we lose an hour, and that is no bueno, but I’m in it for the extra sunshine every day. I’ve already started enjoying it. Days will seemingly last longer, I’ll have better (more?) light for photos, and maybe I’ll even get a few more people into my Zumba classes. People seem to like to come more when there’s more light outside. 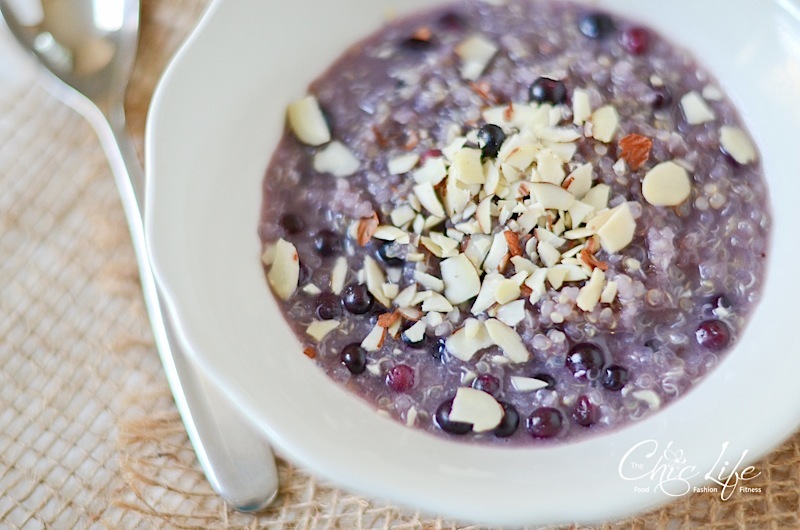 Anywho, on to the food with this Hot Blueberry Honey Breakfast Quinoa Recipe. I made this simple and healthy breakfast for a pre-Zumba meal this past Saturday and posted a photo of it to Instagram. 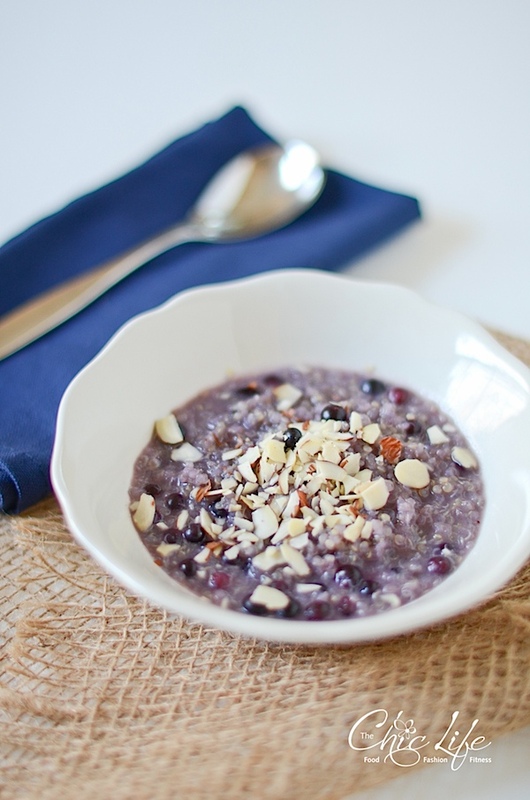 It’s a hot blueberry-honey breakfast quinoa. People immediately started asking for the recipe, so I decided to fast-track it ahead of a couple other posts in the works. When I’m feeling extra organized, I like to make a batch of quinoa and use it in a couple different dishes. I think most grains taste better cooked in broth, but I like to cook quinoa in water so I can make savory and sweet dishes from it. This particular breakfast was as easy as combining a few ingredients in a pot and gently heating through. Top with almonds. Eat. Enjoy. Rock the day. Make a big batch of quinoa cooked simply in water, and this breakfast will come together in a jiffy. I like to cook one batch and use it for multiple purposes like this breakfast. Just toss the ingredients below in a small pot and cook until it’s the consistency you like. So easy! As it thickens, the quinoa gets nice and creamy. I’ve given you some portion ideas, but you can tweak this recipe to suit your appetite. I can’t eat a lot before I work out, so I made a very small amount since I like this before Zumba class, but just adjust as you prefer. Try fresh blueberries when they’re in season. 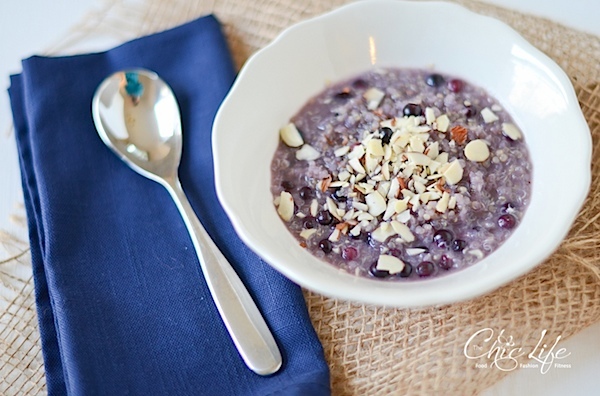 Combine quinoa, blueberries, milk, honey, cinnamon, and salt in a small, non-stick pot. Heat over medium low heat, stirring occasionally, until quinoa has reached your desired consistency. Note: Exact time will vary on your consistency preference and stove heat. Serve in a small bowl and top with sliced almonds (or your other favorite ingredients). Wait until it’s safely cooled to eat and enjoy! The cook time will be approximately 10-20 minutes, depending on your stove heat and preferred texture. 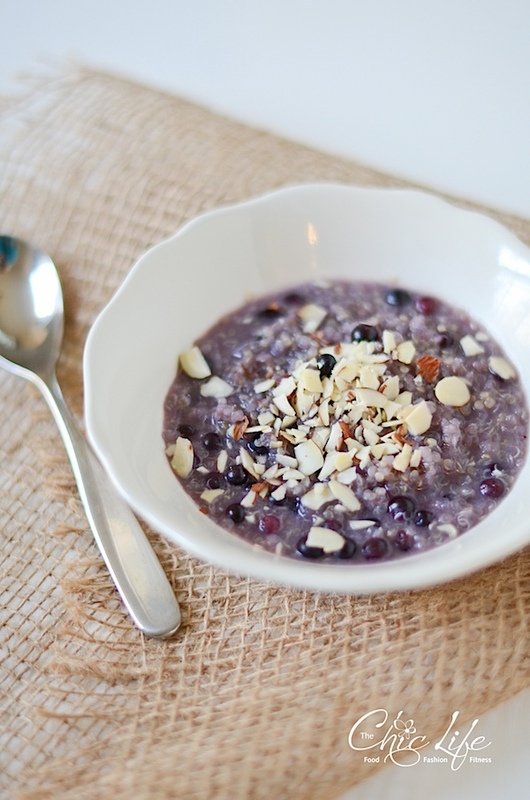 I’m looking forward to eating this more this spring…especially with fresh, local blueberries from the farmers market! 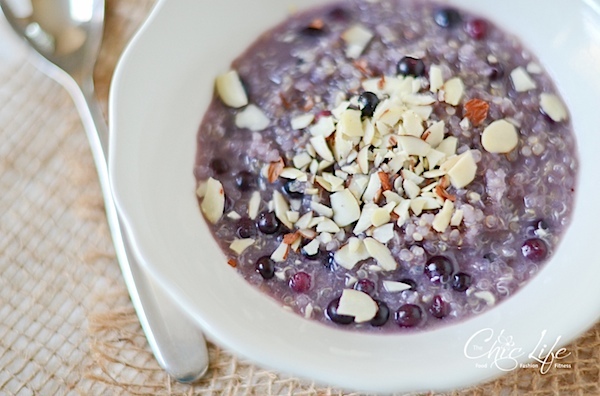 Hope you enjoy this Hot Blueberry Honey Breakfast Quinoa Recipe. Reader question: Do you like or dislike the spring time change? 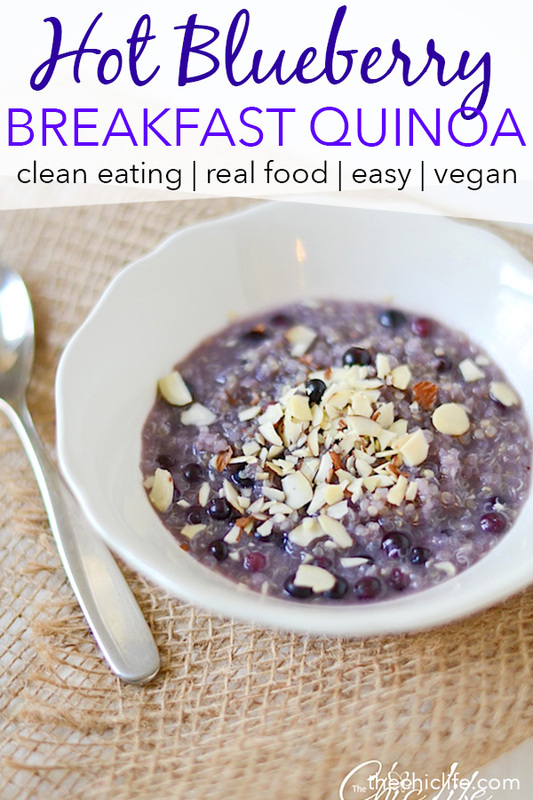 I haven’t had quinoa for breakfast before, but it looks like I need to give it a shot. This sounds yummy! It’s a great way to switch up your breakfast! Great idea! I have some quinoa in the fridge that needs to be used up – will be making this tomorrow! this sounds delish! i hate daylight savings time in general… i grew up without it (indiana didn’t start to change time til i was in college) so it’s very foreign to me! This is exactly what I have for breakfast these days & it feels so light & healthy (except I use coconut milk). I love the time change – with light in the evening, more light, I feel like I’ve come to life again, along with everything else in the Spring!!! Ooh, I bet it’s great with coconut milk! Hmm….quinoa for breakfast. Sounds interesting and it actually looks pretty good. Might have to try this. I have tried quinoa as a side dish and found it rather boring. 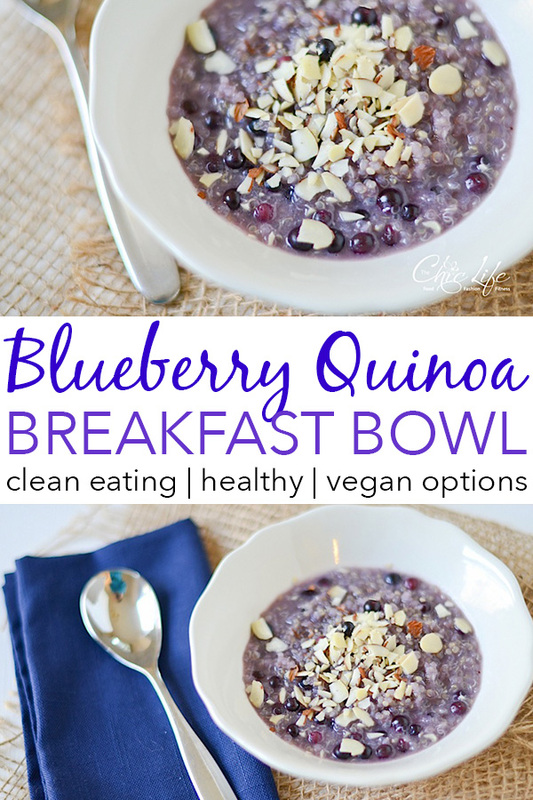 Bu I love blueberries, I will definitely give the vegan variant a try, it sounds delicious! Time change is wonderful. I hate to get up early, but it’s well worth it, when you have so much more daylight!